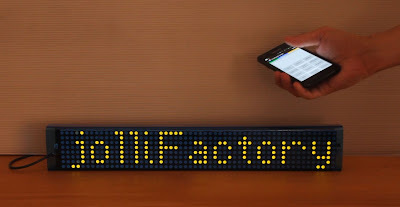 Here, we show how a 7 Bi-color 8x8 LED Matrix Scrolling Text Display is built in which messages and commands can be sent to it via Bluetooth using an Android Smart Phone. 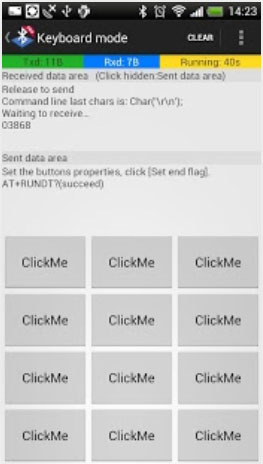 Logically, any devices capable of sending text messages via Bluetooth may be adapted to work with the display. To build this project, basic electronics component soldering skill and some knowledge on using the Arduino or Arduino based micro-controller is required. The reason for building a 7 LED Matrices long display is that it is quite adequate for ease of reading scrolling text and also because the largest tinted acrylic sheet easily available in Hobby or Art shops is 18 inches by 12 inches which is just the right length for making the enclosure for the display as each LED matrix is around 60mm x 60mm in size. The display is build using seven of the Bi-color (Red and Green) LED Matrix DriverModule kits from jolliFactory. Each of these modules uses two MAX7219 Display Driver ICs to drive a Bi-color LED Matrix. These ICs are excellent because they take a lot of work off the micro-controller and simplify the wiring and logic design. 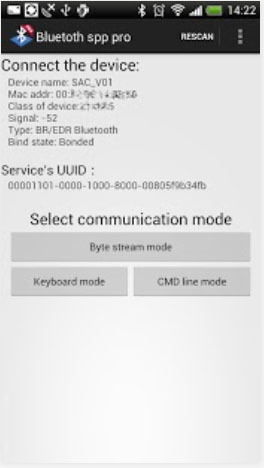 Moreover, there is a ready-made Arduino library for this IC. You can daisy-chain up to four of these Bi-color LED Matrices using only three output pins on the micro-controller for the interface. As our display is make up of seven Bi-color LED Matrices, we need an additional three output pins on the micro-controller to interface with the other three daisy-chained LED Matrices. You can find this Bi-color LED Matrix Driver Module kit from here with information on assembly of the kit. Below shows an assembled Bi-color LED Matrix Driver Module with the LED Matrix not installed onto it. You may also want to check out the original LedControl documentation for more details. Download the Arduino sketch below which is used in this project. You may amend and enhance the sketch to suit your project. 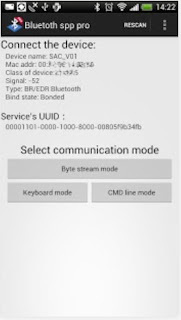 Below shows some screenshots of the Bluetooth spp pro Apps. We will not delve into the detail on building the display enclosure here. We used a 2mm thick blue tinted acrylic strip for the display front protective cover which is bent using a self-made strip heater and another black opaque acrylic strip for the back cover. 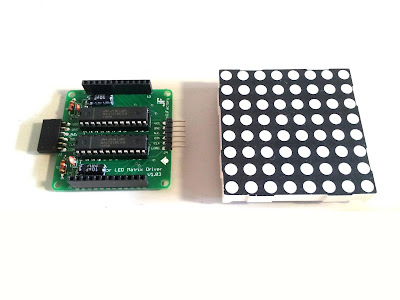 The LED Matrix Driver Modules are secured with ¾ inch stand-offs to the back cover and we managed to place the micro-controller and Bluetooth wireless Serial Port Module below them. 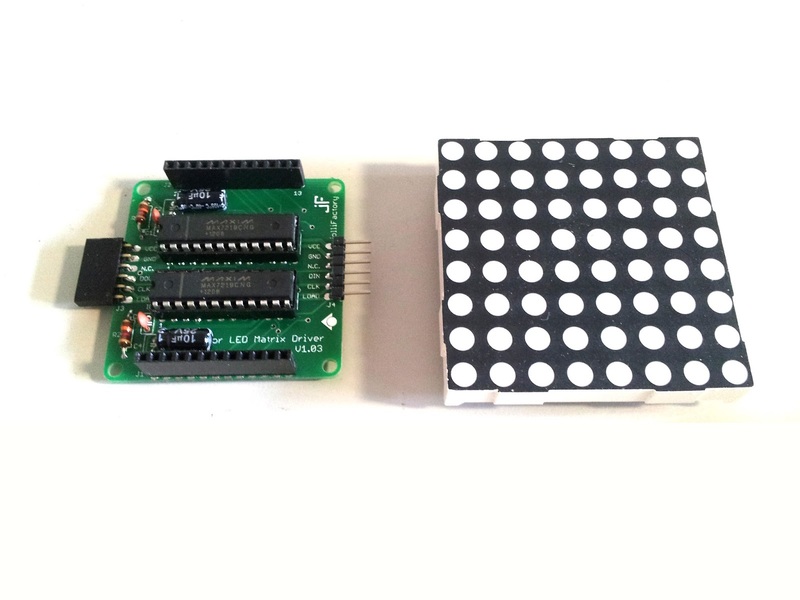 The result is a compact 7 LED Matrix Scrolling Text Display controlled via Bluetooth. Wow so this is how they made the LED. I liked how scrolling led display attracts customers for the business. I'm planning to get one since it shows that it is very effective means to get a customer. Really you mention very well about 7 Bi-color LED Matrix Scrolling Text Display. Photonplay providing all kind of indoor and outdoor Led Display as per the customer requirement. In IDE Arduino Uno displays the following message: Low memory available, stability problems may occur. Thanks for sharing about LED,. It's a really nice article about LED. There are certainly a lot of details about indoor and outdoor led display to take into consideration.Great design and instructions. You made it easy for the normal person to assemble a homemade IR LED pen. The main thing that you might need to include however is that the LED light is invisible to the human eye. Unfortunately, not knowing this, I wasted additional time then I'll admit dismantling it and assembling it back wondering why it didn't illuminate.